The Union Hotel is located on northbound North Broadway / Wisconsin 57, at its intersection with James Street, at 200 North Broadway, De Pere, Wisconsin 54115. The Union House Hotel is the oldest continuously operated hotel in the area. The hotel was begun just one year after a catastrophic fire destroyed almost all of the older commercial buildings on Broadway. The fire consumed three of the city's older hotels, creating a demand for lodging that led Nicholas Altmayer to construct this hotel beginning in 1883. Two years later, Altmayer doubled the size of the building and in 1903 his brother, Fred Altmayer, added a third story. Shortly after August Maternoski purchased the hotel in 1918, he tore down the hotel's horse barn and replaced it with the present brick barn. A small three-story addition that Maternoski added to the east end of the James Street side of the hotel in 1922 resulted in a thirty-four room hotel building. Inside is a comfortable, well-maintained interior with public spaces on the first floor and hotel rooms above. The entrance lobby, bar, and dining booths display a sleek, streamlined Deco appearance from a mid-1930s remodeling, one of the few changes since the building was completed in 1922. 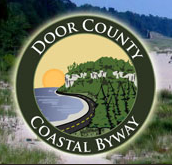 The small marker is visible to the right of the entrance. 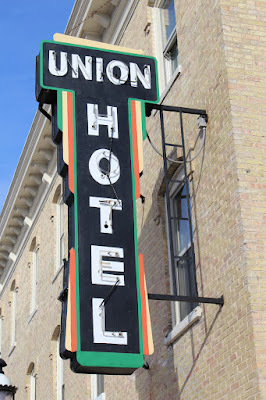 Union House Hotel is located in De Pere, Wisconsin.